I just couldn't stay away! After less than a week of not blogging, I was having withdrawals! Does that make me a blogging addict? I think it does. I wonder if there is a support group, anyone know? I'm not sure if I'll be posting everyday again, just yet; but I will post as I can. It's so rainy and yucky here in Rhode Island that there isn't much else to do except stamp. Yesterday I decided to take a stab at Friday's WSC and Get sketchy challenge. The first one is for Get Sketchy. As you can probably tell, I wasn't feeling my mojo quite yet with this one. The sketch was really great and I think I am going to try to do it again; but for now this will have to do. I knew that I wanted to incorporate the snow covered vellum that I found the other day; but I had a difficult time trying to find a background that would make the vellum stand out. I finally decided on a piece of basic grey, which I layered on a square piece of Not Quite Navy. I also didn't want to cover up any of the vellum, so I decided to just put a simple oval and sentiment in the center. The sentiment is from Inkadinkado. 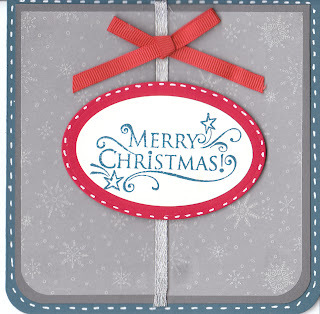 I also felt like the card was a bit bare still, so I added the silver ribbon down the middle and the red bow at the top. I think I had a bit better luck with my second card, which is for Beate's Weekend Sketch. I made a long card, which was different; but fun to do as well. I started with a brocade blue base. I added a piece of Handsome Hunter across the center. Yesterday I went to Michaels and bought some Tim Holtz distress ink in Firebrick red. This is the first time I've used this ink, and didn't realize that I needed a special applicator, so I just used a sponge to add the color. It's a nice ink to work with and I will definitely pick up some more and will be doing some more investigating into techniques for it. I embossed some snowflakes with white embossing powder and then spritz the entire piece with a bit of water. I ran another piece of Handsome Hunter paper through my CB with the Swirls embossing folder. I cut the two scallop circles with my Petite Scallop Circles Nestabilities. I cut a 2 15/16 white circle and stamped the Santa image from Inkadinkado in black ink. I used the same distress ink with my aqua painter to fill in the top of the hat. I used my E00 skin copic marker to color in his face. Now, it's hard to se in the picture; but I did add some irridescent ice embossing powder to Santa's beard, to give it a little sparkle. Finally, I embossed the sentiment also from the same Inkadinkado set at the top and finished the card. So, that's all for me today. I hope you all enjoy the rest of your weekend! thanks for stoppin by my blog and commenting, your two Chrsitmas cards are adorable, I really like the the snow vellum....I am so vellum challenged...lol...yours is beautiful.....have a wonderful day! Lovin' both of your cards!!! Great job on the bonus challenge over at Get Sketchy...love the faux stitching! Both Christmas cards look wonderful! I love the laughing Santa on the second one! can never have too many cute Christmas cards. ;-) But you can have too much yucky weather. It finally cleared up today for us in VA. I hope it has in RI as well! I just love your take for Get Sketchy, love the colors!